Previously we discussed in brief the conductors used in overhead transmission line. Now we will discuss about transmission lines accessories and some construction issues in brief. 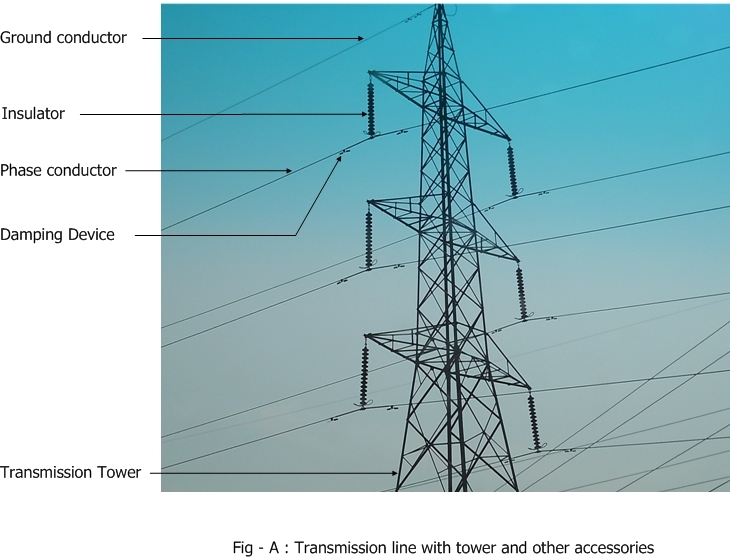 A transmission line requires few accessories as listed below. 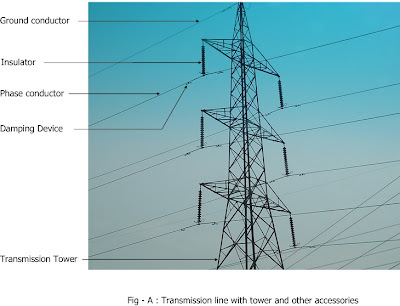 The transmission tower or pylon is one of the most important accessories of a transmission line. As the whole load of the line and accessories are taken by the towers so its design is crucial. For construction of a transmission line the type and numbers of transmission towers required depends on many factors. Transmission tower is designed to carry the whole load of phase and grounding conductors in normal and abnormal conditions. The design requirements in icy, non-icy, coastal areas, cyclone prone areas and heavily air polluted areas are different. Due to the deposition of ice on conductor the weight of line is increased considerably resulting in heavy load on the tower. In the cyclone prone areas the conductors and towers experience severe wind loading. In such situations if these factors are not properly taken care of, then the conductor may snap and the tower may collapse. In the design process all these factors are taken care of. Climatic condition plays an important role in tower and line design. For the purpose, climatic load data is collected. The tower foundation type depends on the soil. Also seismic data of the concerned region is collected for tower design. The tower types generally used are Lattice structure, Guyed V, Tubular pole type etc. We have already discussed about the conductor types used in transmission lines. Insulators for use in transmission lines can be categorized different ways. The main function of insulator is undoubtedly to insulate the live conductor from the metallic tower at ground potential but the important thing is that the insulator should be able to carry the load/tension in the transmission line. At angle towers or at dead end the insulators should be able to carry large tensional force. The insulators used for transmission lines are mainly of porcelain or composite polymer types. Traditionally porcelain insulators are used for both transmission and distribution purposes. In the coastal areas the climatic condition also influences the selection of materials . In the coastal areas salt deposits on the insulator surface, that results in increased leakage current on the insulator surface. Similar situation arises where lots of suspended chemical particles are present in the atmosphere. While designing the transmission tower and selecting the conductor all these factors are taken into account. We will devote one article about insulators. Due to wind and ice, the transmission lines swing under different modes. The transmission lines may vibrate in three major ways. Galloping : Due to the deposit of ice above conductor surface, the conductor cross section resembles an aerofoil. The wind flowing across the conductor (aerofoil) results in Galloping of conductor. Galloping is the oscillation of the conductor at high amplitude and low frequency. The conductor may oscillate in vertical or horizontal plane. Generally the conductor oscillates in vertical plane. The amplitude of the oscillation may be more than a meter with frequency upto 3 Hz. Due to galloping the clearance between the conductors may reduce very much to initiate flashover. Structural damage may also happen due to conductor gallopping. Anti-gallopping devices may be fitted to reduce the affect of gallopping. Wake induced vibration: Wake induced vibration takes place in bundled conductors. The aerodynamic forces in the downstraem of conductor gives rise to this form of oscillation. It has amplitude in centimeters. The oscillation is reduced by keeping the spacing of bundled conductors large enough. Every electrical system is equipped with a earthing system. The ground wires (also called shield wire) run above the phase conductors and protect the line from direct lightning strokes as the lightning strikes first the ground conductor due to its position. The foot of the transmission towers are properly earthed so that the potential gradient near the tower remains within the limit and protects the human beings and animals around the tower in faulted condition. Foul weather conditions can lead to corona discharges on high voltage over head transmission lines which are perceivable as an audible broadband crackling and hissing noise. In over head transmission, A square wave arc model is considered to represent the long electric arc in the free air. over head transmission lines planning, routing, and design and material supply within a stipulated time schedule is must. Electrical transmission lines are very widely used to transmit high frequency signals over long or short distances with minimum power loss.